In layman language, CRM is a software that manages the relationship with customers and clients of the organization while ERP is a unified software program that manages the business processes of the entire organization. It lays emphasis on the planning of the resources of an enterprise to increase efficiency, effectiveness and economy of the enterprise. Customer Relationship Management (CRM) and Enterprise Resource Planning (ERP) are the two software, which is implemented by the companies in their organization to increase their profitability. These two are used for different purposes, in the fact that the former is used to track each detail of the company’s interaction with its customers, whereas the latter is a complete package. If you are searching for the differences between CRM and ERP system, then this article will help you out. 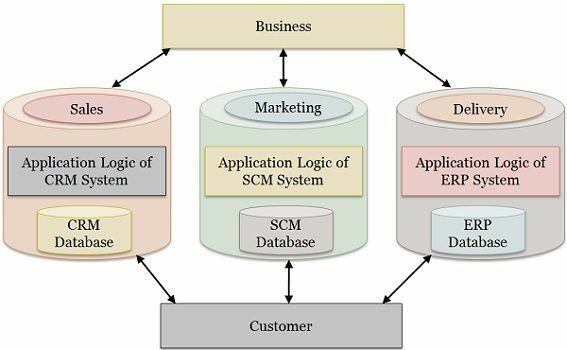 Meaning A computer software that ensures companies to record every transaction and interaction with the present and prospective customers is CRM. An integrated pre-packaged computer software that lets the organization to manage and control business processes, going on in the organization. Customer Relationship Management is shortly known as CRM. It is a computer software, specially designed to capture every minute detail about the transaction of the company with the clients and customers. The objective of implementing this software in an organization is that it builds trust in the customers for the company and maintain a healthy long-term relationship with them. It is used to serve the customers in such a way that their satisfaction level is maximized. CRM consolidates the information name, phone numbers, address, email, etc. about the existing customers, along with their history of interaction like purchases, technical support, etc. with the company, into a single database and hand over the information to the employees, handling the client, so that their expectations are fulfilled. It may include the information about potential customers also, like their needs and preferences, to create a relationship with them and providing them better products and services. The software includes strategies like employee training, relationship building, advertising, etc. that are developed considering the requirements of the clients. Enterprise Resource Planning or ERP is a pre-packaged business management software used to improve the performance, profitability, and productivity of the enterprise. The computerized software collects information from various departments of the organization, records & integrates and interprets it to both internal and external management of the organization. ERP integrates the key areas of the business like purchases, sales, manufacturing, human resources, services, inventory, etc., to smoothen the business processes and flow of information across the organization. The prominent feature of ERP is the shared database that provides an array of functions which is used by the various departments of the organization. When this software is implemented in the organization, all the departments can access updated information. In addition to this, the entity is also able to analyze the profitability, performance, and liquidity at any point in time. The most significant benefit of this software is that as it is an integrated software and so the redundancy of data is minimized. The software provides standardized processes, procedures and reporting as well that are common in the industries. CRM is defined as software that lets the organization to trace every transaction with the clients and customers. ERP refers to a software program that helps the company to manage its business processes, going on across the company. ERP consolidates the information provided by various functional groups of the organization through systems like CRM, Supply Chain Management (SCM), Human Resource Management (HRM), etc. ERP was developed earlier than CRM. The CRM is mainly utilized in conducting back office activities, whereas ERP is used in accomplishing back office activities. CRM is oriented towards the management of customer relationship with the enterprise while ERP is mainly concerned with planning the resources of the organization to ensure its best possible use. CRM focuses on increasing sales, but ERP gives emphasis on reducing costs. Customer Relationship Management helps the organization to maintain a long-term relationship with the customers. In addition to this, it is also useful to know about the preferences of the clients and develop trust. 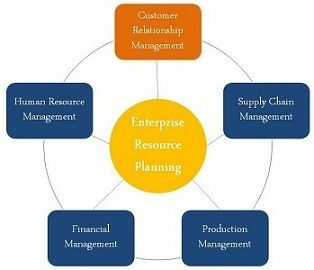 ERP combines various functional units of the organization together so that they can freely share the information and communicate with each other on a real-time basis through a single computerized system. Apart from the above differences, there is one thing common in the two software and that is they both aim to increase the profitability of the company.